Eight is Great! 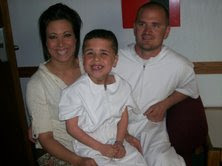 Our handsome little guy was Baptized April 18, 2009 at 6pm. We had a great turn out for his big night. Grandpa and Grandma Beyeler drove up from Utah along with great grandpa and grandma, and Grandpa Vance also was able to come up. Conner had family from othello as well as moses lake attend; and some good friends. We appreciate them all for traveling such a ways to support Conner. 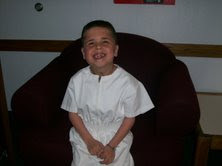 It was a special night for him and he was so excited to have his grandparents there. I think I was more nervous than him! 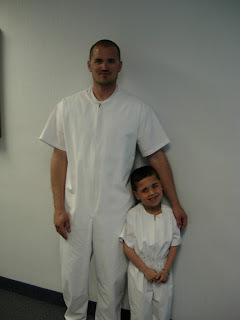 They do baptisms by stake here, and there were quite a few kids, but it went smoothly, and Conner did great. He even made everyone laugh when he came up out of the water and shook his head like a fish and blubbered on about the water. He always seems to make everyone laugh one way or another. We have so many pictures from when grandparents were here and will be posting them soon. We love Conner and are greatful he has made this decision in his life. Way to go Conner! Congratulations! So glad to see you back Jenica, I have missed you!